Most vintage fountain pen collections should include a Waterman Fountain pen. The L.E. Waterman Fountain Pen Company started in New York in the 1880s and was a stalwart in the Fountain Pen business during the production dates of the 52. Lewis Edson Waterman was the founder of the company in the late 1800s and credited with its successful start. The Waterman 52 was produced during the 1915 to 1930 time period. This period marked a high water mark for Waterman as they produced a large number of varieties of hard rubber pens. The 52 was one of the most common and survives in large numbers today. Relatively simple to restore (provided all of the parts are in good condition), it often has large flexy nibs which several collectors enjoy using. As I mentioned above, this model is a clipless one. The pen had an aftermarket clip attached, which I immediately removed. I do not like these. I certainly understand why they were used, but practicality aside, they usually leave gouges and discoloration – enemies to restoration. Clipless models were produced in the 52 line of pens, presumably to be used with aftermarket clips or without clips for easier carrying in a bag, purse, or case. 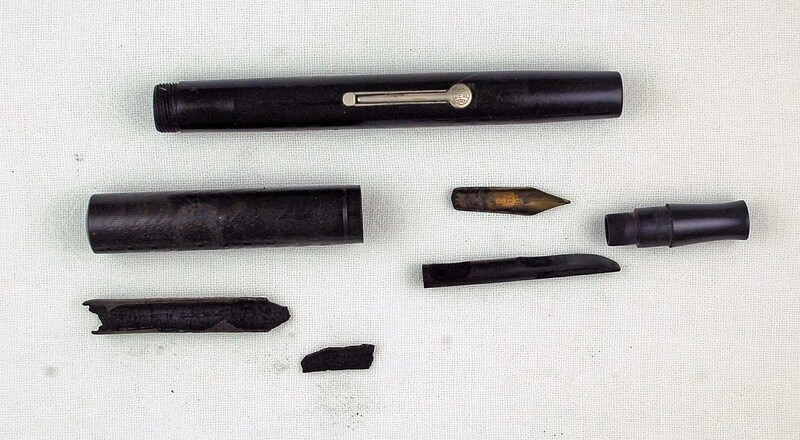 Below is a photo of the pen after I took it apart. The inside pressure bar is still intact. You can see that the old sac has hardened and come out in pieces. The only wording that can be seen on the nib is the number “2”. (more on the nib later) Also note the damage done by the aftermarket clip in the center of the cap. Remembering that these pens are made of hard rubber eliminates, for me, the use of water in cleaning the exteriors. I did use a bit of water to swab out the inside of the cap, the inside of the section and the grooves of the feed. I then polished the lever and went to work on the nib. It is 14K and after I cleaned off the rest of the old caked on ink from it, I realized it was not Waterman No, 2 (the appropriate nib for this pen), but a Hallmark No. 2. A photo of this nib and additional research follows later. I reassembled the section / feed / nib and attached a size 16 sac to the section. The only remaining work was to remove the damage done by the aftermarket clip. Some rust like substance had attached itself to the cap where the clip had been and I worked at this with my fingernail and a dry cloth. I also used a small amount of toothpaste, just enough abrasive substance to work out the final remnants. I then rubbed it clean using a clean cloth and let it sit. I really is quite amazing that there really is little evidence that the clip had been there for many years. 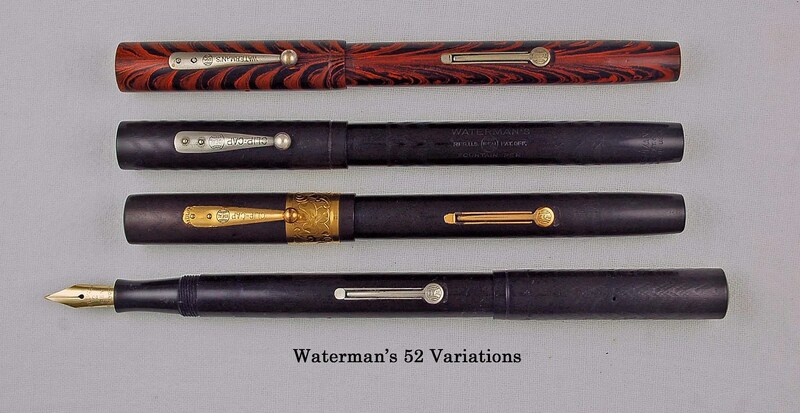 Waterman 52s came in many varieties. I won’t attempt to discuss the Waterman numbering systems, which would be enough to confuse anyone, but in summary the 52 came in several different colors, textures, and with add-ons. This pen, at the bottom of the photo below is this plain BCHR version without a clip. It appears to me that the nib had been on this pen for quite some time and was not a recent replacement. The questions arise as to where did the Hallmark nib come from and was there a Hallmark Pen or Pen Company? 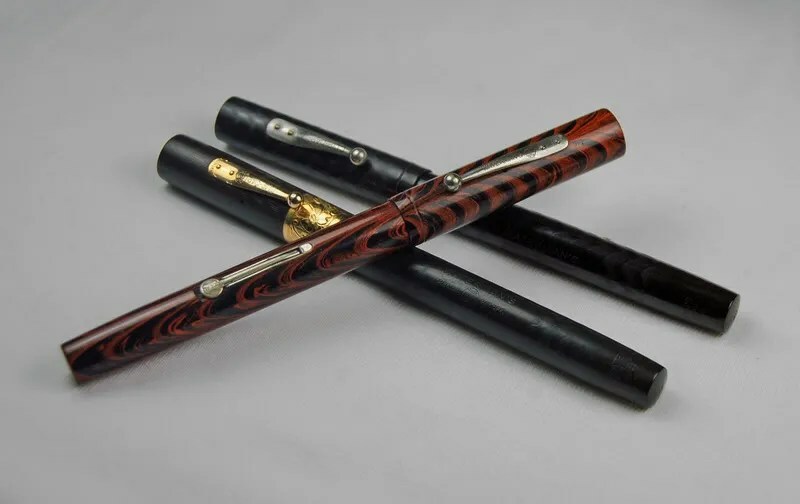 Hallmark Pen Barrels – my friend, the late Dennis Bowden, discusses a Hallmark barrel and the possibility it is related to Kraker (I know…not another Kraker connection). Hallmark Pen Company (NY) and Hallmark Nib – Various collectors discuss the existence of Hallmark Pen Co. in NY and a nib sighting similar to mine. The interesting thing here is that the nib mentioned was being sold by Max Davis, noted Waterman collector and author. A connection to Waterman – maybe? I have no other information on the Hallmark Nib. I have sent out some queries and will update this post if I learn more. 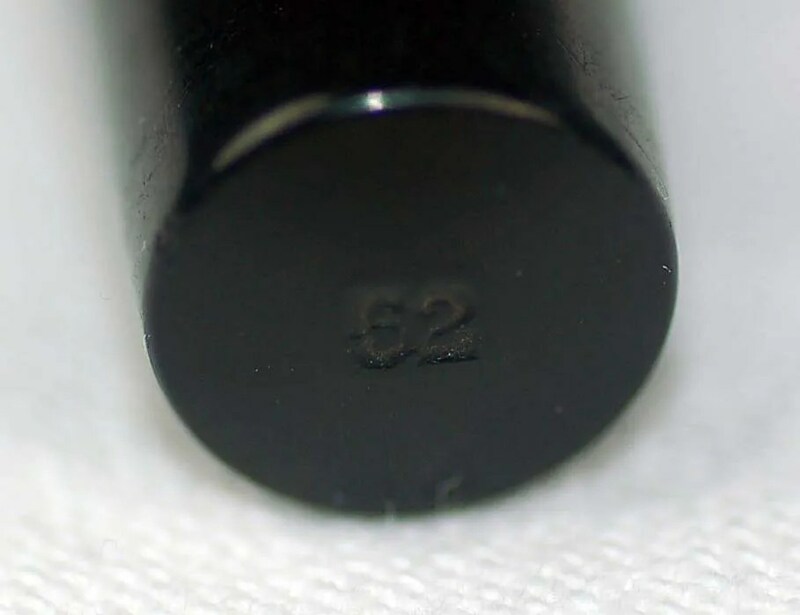 Below is a photo of the familiar Waterman marking, identifying the model number on the bottom of the barrel. Here is the standard imprint, seen on Waterman 52s. This pen turned out well. It has retained its deep black color, with few signs of any discoloration at all. The damage done by the aftermarket clip was removed and I am currently using it with Diamine Imperial Blue ink. The Hallmark nib has some nice flex to it, similar to many of the Waterman nibs of the period. If anyone has any Hallmark information, please let me know through the comments below. Thank you. You can see below that the pen that I found has survived well and would be quite easy to restore. I have worked on several 52 varieties before and if (and when) the lever box is bent or broken, the restoration requires much more time and effort. I began by cleaning all of the gold gently at first to make sure that there would not be any gold loss. Perhaps I am a little paranoid on this, but I always wonder if I am going to run into some substandard gold or plating. Fortunately none was encountered here and the furniture polished well. The nib was polished and took a bath in the ultrasonic cleaner. I installed a new silicone sac to protect against future discoloration of the barrel and this pen is ready to go. Here is the finished product. The pen measures 5 1/4″ capped and 6 1/2″ posted. The black hard rubber versions came with both silver and gold furniture. As you can see, the 52 line has enough varieties to keep a collector busy for years. This pen falls into the banded (or repousse) category. The cap band is very ornate and has an empty spot for engraved initials or name. Here is a photo with the other two 52s in my collection, restored in past years. The top pen is a Rippled 52 and the other is a BCHR with silver furniture and a gold nib. 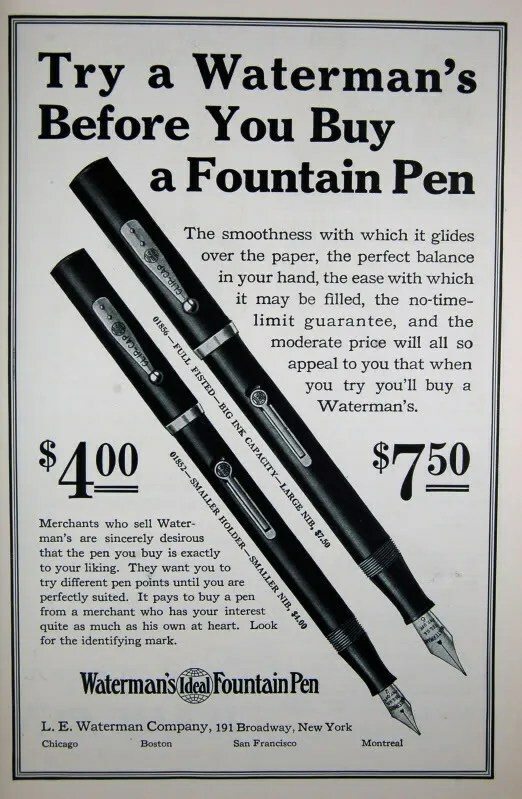 Interestingly, the popularity of the Waterman line ended shortly after the production of these (and all other Waterman Hard Rubber Pens) in the late 20s. Waterman did not react as quickly to the emergence and popularity of celluloid pens (Parker, Wahl, Sheaffer) in the late 20s and early 30s. They continued to produce pens, and evolved to the competition, but never retained the market share that they had during the glory days of the 52 and other hard rubber pens.